Western Australia’s Technology Park (TPWA), Bentley, was established as the first such facility in Australia in 1985. Designated land was gazetted according to legislation in 1986. 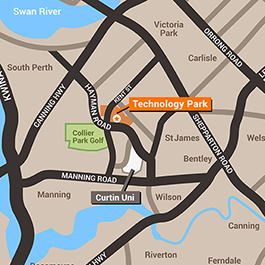 Adjoining land currently occupied by the Department of Primary Industries and Regional Development in the locality of Kensington was also gazetted as Technology Park in 2007. This extended the TPWA area established and managed by the Minister under section 6(e) of the Industry and Technology Development Act 1998 (ITD Act). The uses of TPWA and associated land of some 60 hectares are controlled by the special use zoning for research and development within the Kensington locality by the City of South Perth, and within the Bentley locality by the Town of Victoria Park. TPWA serves as a diverse technology hub and as important common-use infrastructure for technology development in Western Australia . Many leading local, national and international science and technology companies are based here. A current listing of TPWA’s residents is available here. Provide modern common-use economic infrastructure to further growth and economic diversity. The Government of Western Australia, through the Department of Jobs, Tourism, Science and Innovation, administers the ITD Act and is responsible for managing Technology Park WA, Bentley and Kensington. The Department engages the services of Burgess Rawson Pty Ltd, for the daily operation of TPWA and common-use facilities.